So you may have noticed we’ve been on a pumpkin baking kick lately, ie. 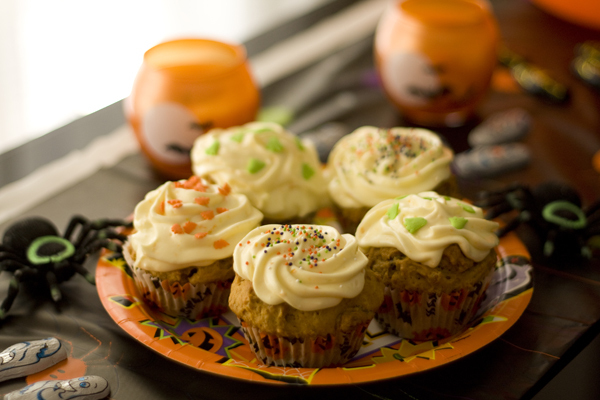 pumpkin mini muffins and pumpkin bread with cinnamon cream cheese frosting. We tried to balance out all the baked goods with a healthy pumpkin soup, but it was a DISASTER. We tried to make it savoury, then realized it tasted better sweet. We tried to correct our mistake…. but it was no good. It was a sad day for pumpkins everywhere. So this time around, we decided to continue baking with pumpkin because you can’t go wrong. Sugar has a way of making everything better, doesn’t it? 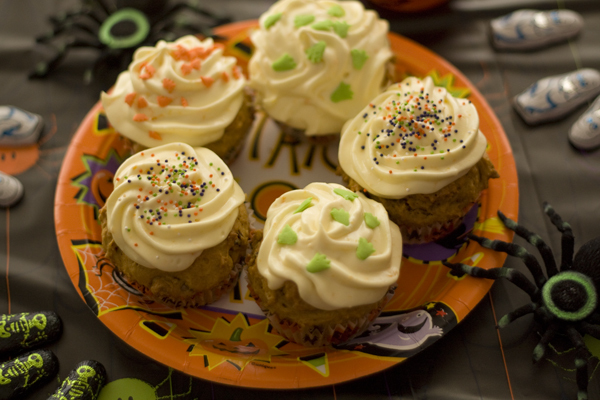 Serve these on Halloween! Fresh from the oven muffins would be wonderful after returning from trick-or-treating with the kids. Or on your own. Or from getting a blast of cold air every time you open the door to give out candy. That takes work too. 1. 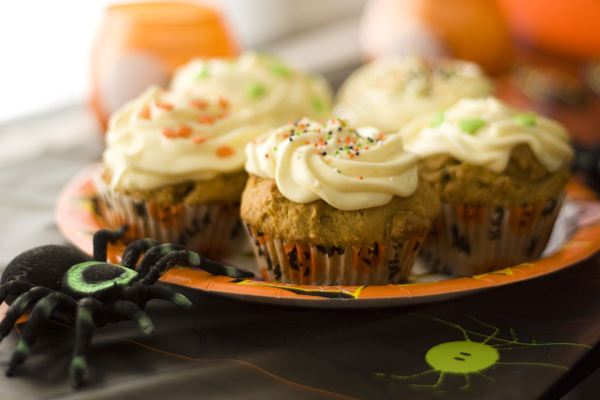 Preheat oven to 375 degrees F. Line a muffin pan with Halloween-themed muffin cups. 2. In a medium-sized bowl, stir together flour, walnuts, raisins, cinnamon, ginger, nutmeg, all spice, salt, baking soda and baking powder. Set aside. 3. In a large bowl, whisk together eggs, sugar and oil. Add pumpkin puree and stir until combined. Stir in flour mixture until combined. 4. Spoon the batter into muffin cups, and bake for 20 to 22 minutes in the center of the oven, until a toothpick inserted in the center of a muffin comes out clean. 5. Let cool for a few minutes before removing from pan. Let cool before serving. These muffins are excellent on their own, but even better with orange cream cheese frosting! 1. In a large mixing bowl, beat together the cream cheese, butter and icing sugar until light and fluffy. Add the orange juice and orange zest and mix until incorporated. 2. Spread the frosting and decorate muffins. Makes 12 – 14 muffins.